We love webinars for a whole host of reasons. While they’re hefty beasts to make, taking a lot of time, resources and commitment, the subsequent payoff is always worth it; SEO for your website, plenty of content worth repurposing into blog posts, infographics or whitepapers, and ample lead generation. What’s not to like? That said, if this is all that you’re using your webinars for, you’re missing a trick. An extremely versatile format, you should really be implementing them into your sales and marketing strategy. By buckling up and reading more. We’ll be outlining the best ways to create webinars that close more business. Firstly, let’s look at the benefits of using webinars as a part of your marketing - or sales - strategy. The primary is the simple fact of their versatility. It’s too broad to simply say ‘webinars are good for Z but bad for Y’, because you can choose so many different formats or styles in order to convey your point. This means that webinars are particularly useful for sales funnel targeting. Different webinars will suit a variety of attendees based upon the point they’re at in the sales funnel - we’ll go into this more later. Secondly, webinars are a much more personal approach to sales and marketing, because it’s a way of communicating directly with your prospective clients on a face level. Far from the anonymity of blog posts or social content, a webinar uses real humans who are often live. There’s direct contact with the presenter, which instantly builds trust between the business and the potential client. Furthermore, webinars are engaging and interactive, creating the sense of a conversation, regardless of whether your webinar is aimed at a B2B or B2C audience. The catch? It becomes even more crucial to ensure that your webinar is of a high quality. Otherwise, all your work will be a waste. Webinars can’t be used as filler content, and they can’t be bogged down with fluff that’s not really achieving anything. Well, they can - but you’ll be wasting money and resources whilst testing the patience of your attendees. If you’re all about using your webinar to close business, then you’ll want to approach it by making them straight-forward, clear and purpose-orientated. Subsequently, if you don’t have anything significant to say, then there’s not really any point in saying it - and especially not in a webinar format. So, wait until you have something meaningful to base your webinar on. Perhaps you have a new product or service that you want to promote; a webinar would be a perfect way to launch it. Similarly, always go into your webinar with clear goals in mind. Consider not only what your audience will take from the webinar, but what you hope to gain from it - set realistic goals so that you can monitor your own success. For example, aspire to take away a number of new leads, or close a few more sales with attendees further down in the sales funnel. Speaking of the sales funnel, it's a good opportunity to remind you that the versatility of webinars allows you to shape them around your audience. Identify the relevant demographic, and tailor your webinars towards specific stages of the sales funnel. For example, if you’re looking to generate new leads, then you could choose to run a thought leadership webinar that targets a wider range of attendees within your industry. It’s a good way to get your company’s name out there, offer interesting, fresh ideas and potentially entice brand new B2B clients to the very top of the funnel. Webinars require a sign-up and a registered interest, so they’re a brilliant way to garner new names for your mailing list and to seek out potential leads. Even if they don’t end up attending the webinar, you’ll still have the opportunity to follow up with them via email and subsequently open up a dialogue about your business. 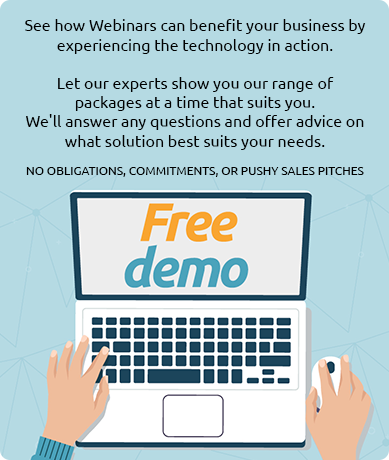 Alternatively, for potential clients who may be closer to committing or making a purchase, you have a much higher chance of closing business with them by hosting a product demo webinar. Regardless of what kind of webinar format you’re looking to create, or the audience it’ll be geared towards, it’s crucial to ensure a high quality from the offset - including in the planning stages. Once you’ve got a meaningful subject for your webinar with a relevant purpose, ensure that you put the time, energy and research into your topic. Identify a CTA for your attendees based on your objective, and implement it into your plan so that it is clearly demonstrated to your attendees. Then, incite them to follow through with it by providing an engaging webinar that clearly addresses your points. The presentation of your webinar should complement its purpose and CTA. For instance, a product launch webinar could begin with an identification of a current problem or gap in your industry. You can offer viewers a brief rundown of your own experience before offering a solution or idea that demonstrates the benefits to attendees - then, showcase your product or pitch your sale. You can be creative in the ways that you do this. For example, you can use storytelling, or there are plenty of ways to make your webinars interactive and engage your audience. Both of these are techniques that’ll make your actual sales pitch more powerful, whilst also making it seem less sales-y. So you’ve got a plan, you’ve got your research, and you’ve got your pitch. Now, you’ve just got to tie it all together. Write a script for your webinar. This will ensure that your points are concise, you don’t forget anything important, and you don’t go off on long, rambly rants that’ll bore your audience and eventually make them click away. Implement your resources accordingly. If your webcasting provider is a good one, it’ll offer various tools that you can use to give your webinar a bit more zing - we’re talking polls, downloadable resources and chatboxes that’ll help you engage with your attendees throughout, and gage whether they’re following the webinar. One more vital - and often overlooked - step is to prepare for the problems posed by technology. Don’t be caught off guard. Whilst live webinars always pose a bit of a risk, after all, these things happen, there’s a big difference between looking disorganised, unprepared and a bit silly, and simply having a minor blip. What we mean is ensure you’ve got a quality webcast provider, with constant technical support, and that you’ve tested the platform by using a free trial or demo. Never go live on a platform that you’ve not tested out beforehand - that’s just asking for trouble. Similarly, ensure you’ve got a high quality internet connection, a good microphone, and versatile software that’ll allow for easy integration, access to analytics and an overall smooth sailing experience. Remember, your goal here is to close more business - you need to look as professional as possible. So use a professional platform. So you’ve got everything together. You’ve planned, practised and your software is tried and tested. Do one last run-through with all of your possible co-runners on board, testing out all of your visuals, tools and resources to ensure that all is working as smoothly as possible. Then, it’s time to promote. Send out mailers, reminders, and use your social networking system to reach out to your desired attendees. Remember, you’re targeting the relevant demographic based on the sales funnel, so take advantage of this. For example, if you’re looking to target potential new leads, attempt to make a wider reach by utilising networking hours relevant to your industry, or working with social listening tools. Alternatively, use your existing mailing data and past sign-ups to target attendees who have already expressed interest in your product. Every webinar that you host should be different, offering something fresh and new to your attendees and potential clients - regardless of whether they’re B2B or B2C, and their current position on the sales funnel. The trick is to identify the exact what, how and who behind each piece of content - and to always remember this: that filler is the enemy. We hope you found this helpful! We’ve always got more tips and tricks in our Knowledge Bank, and we’re always happy to offer free trials and demos for our FastCast system. If you have any other questions, get in touch and let us know!